This week on the blog, we’re sharing another one of our wonderful couples in our Real Weddings series! 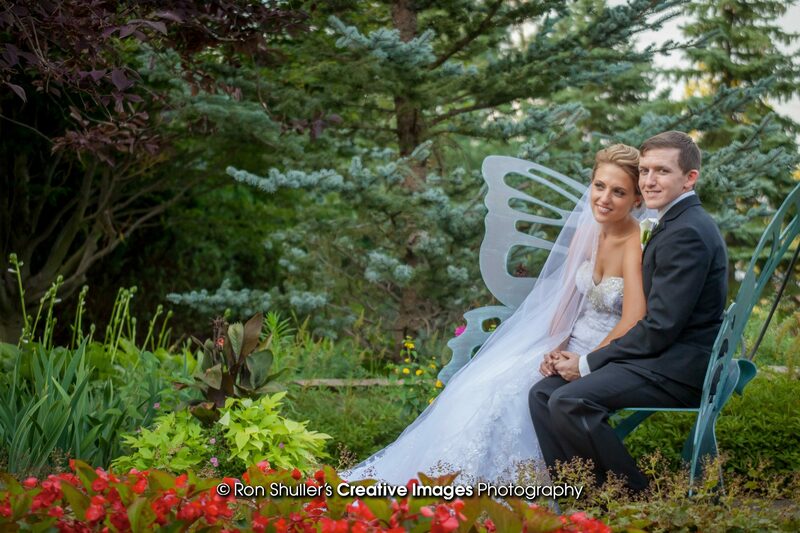 This week, we’re featuring Michaela and Blake’s romantic starlight-themed wedding. 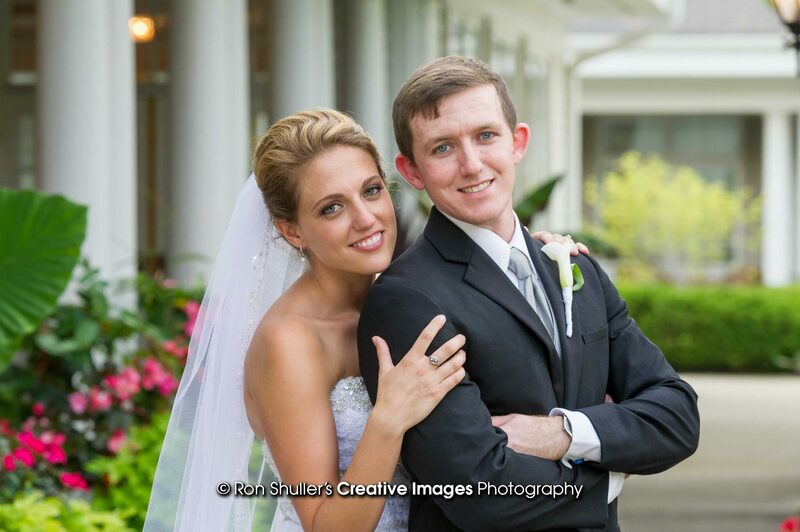 Michaela and Blake were married last summer in a beautiful, romantic ceremony at The Manor House in Mason, Ohio. We had the pleasure of working with Michaela and her mother, Brenda, to create all of their stationery items from their invitations all the way through their ceremony and reception pieces. Brenda and Michaela first came in to meet with us almost a year in advance, which gave us plenty of time to narrow down ideas for the invitations. 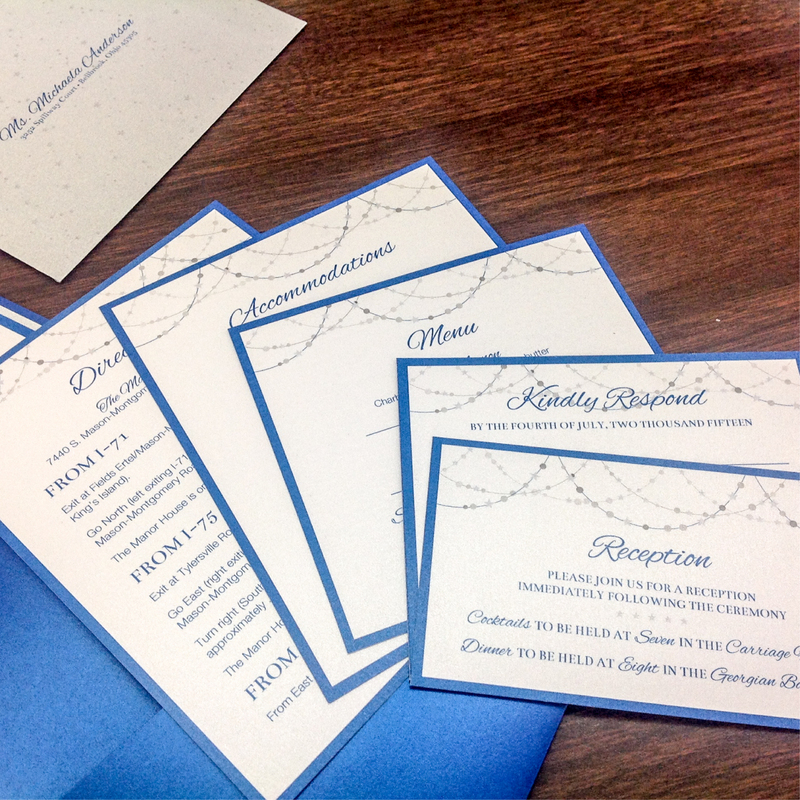 After a few consultations where we discussed different design options, papers, and much more, Michaela and Brenda finally settled on a beautiful Stardream paper in white and silver, along with a stunning Pocketcard from Envelopments in Mercury Blue. 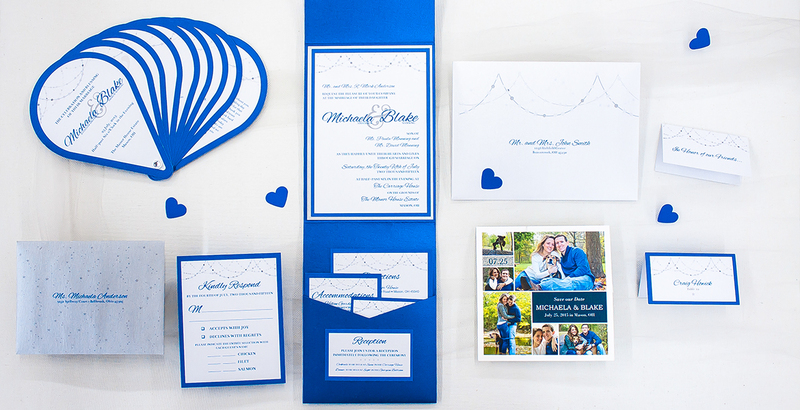 We created a soft, romantic invitation suite with silver stars and string lights and bold pops of royal blue to match the Pocketcard. 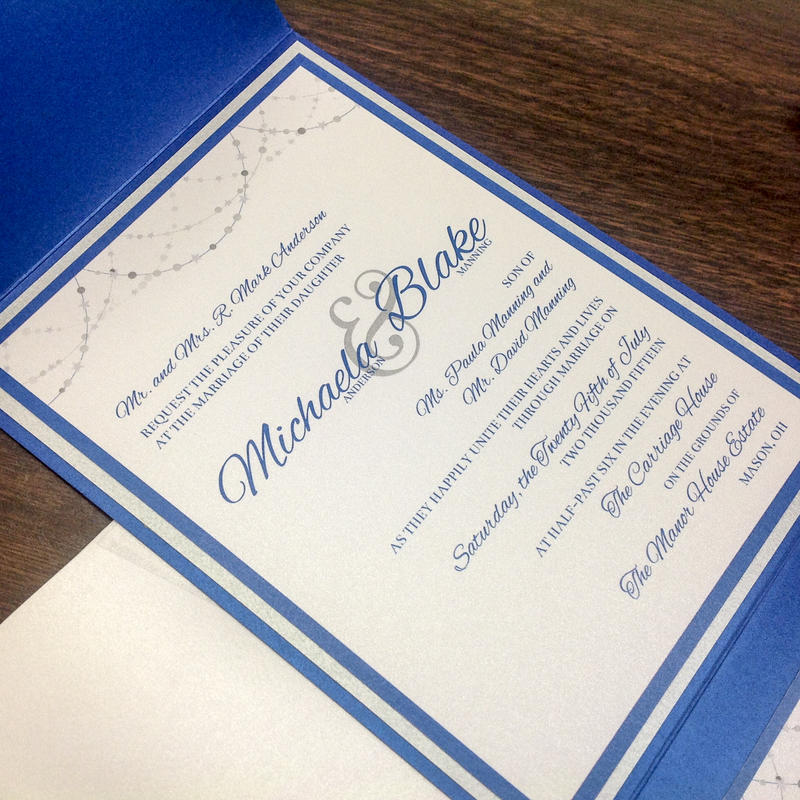 Michaela and Blake’s invitation set included several enclosure cards for their guests, including a menu card for their meal choice, directions to the Manor House, and accommodations nearby. We also assisted Brenda and Michaela in creating the ceremony and reception items for the wedding, including their layered fan-style programs that were die-cut into teardrop shapes. As guests entered the reception hall, they were greeted with a beautiful seating chart matching their design and bold blue placecards with their name at the table. The couple used wine bottles with custom labels as their table numbers, and each place setting had a small card in honor of friends of the couple, for whom they made a donation to cancer research. 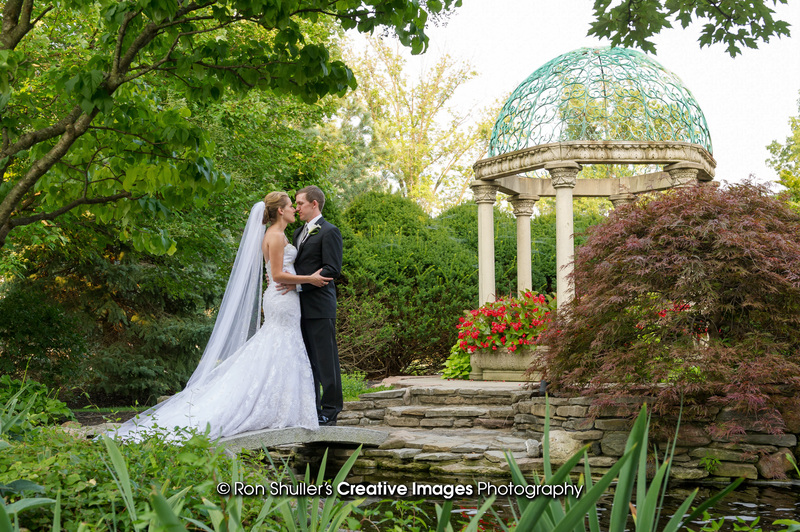 We cannot thank Ron Shuller’s Creative Images Photography enough for sharing some of the beautiful images of Michaela and Blake’s wedding day with us! 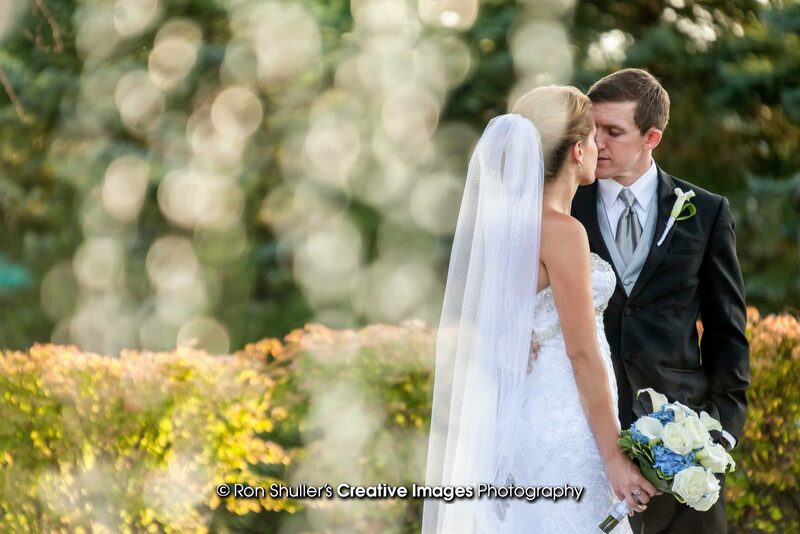 And keep following the blog for more of our real weddings couples coming soon! Chelsea is a wedding-obsessed graphic designer who is passionate about creating beautiful, unique stationery for each and every bride she works with. When she's not browsing photos on wedding websites, she can usually be found curled up with her cat and a good book.